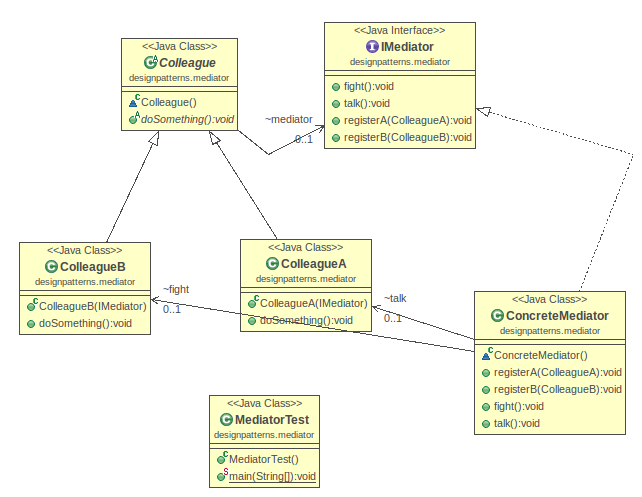 Mediator design pattern is used to collaborate a set of colleagues. Those colleagues do not communicate with each other directly, but through the mediator. In the example below, Colleague A want to talk, and Colleague B wants to fight. When they do some action(i.e., doSomething()), they invoke mediator to do that. Among other behavioral pattern, Observer is the most similar pattern with Mediator. You can read Observer pattern to compare the difference. this.mediator.registerA(this) should be called in constructor, not in doSomething() method. why I think some of these patterns are almost the same .